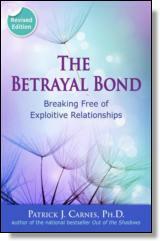 In The Betrayal Bond, Dr. Carnes presents an in-depth study of these relationships; why they form, who is most susceptible, and how they become so powerful. Dr. Carnes also gives a clear explanation of the bond that compels people to tolerate the intolerable, and for the first time, maps out the brain connection that makes being with hurtful people comparable to 'a drug of choice.' Most importantly, Carnes provides practical steps to identify compulsive attachment patterns and ultimately to change or end them for good. Patrick J. Carnes, Ph.D., is an internationally known authority on addiction and recovery issues. He has authored more than twenty books including the bestselling titles Out of the Shadows: Understanding Addiction Recovery, Don't Call It Love, and A Gentle Path Through the Twelve Steps. Dr. Carnes' research provides the architecture for the 'task model' of treating addictions that is used by thousands of therapists worldwide and many well-known treatment centers, residential facilities, and hospitals. He is the executive director of the Gentle Path Program, which specializes in dedicated treatment for sexual addiction. Visit Dr. Carnes at www.patrickcarnes.com.